My mom came across this recipe and has been wanting to try it for a while. On Labor Day we were grilling out some pinwheel steaks and for some reason I really like risotto with steaks. I actually have this weird obsession with making risotto lately, but that is another story for another time. My Mom's mint was also starting to grow kind of wild, so it was a perfect day to try it out. I am not sure if this is exactly where she found the original recipe, but it is the exact recipe we used. We followed the recipe almost exactly, except we halved the recipe, and maybe added in a little more cheese (you cannot use too much cheese!). The only thing I would do differently is possibly add in some mascarpone cheese (like I used in this Lemon Risotto dish), and I would also add the mint right before serving. The mint started to turn brown in a few places once it hit the hot dish. Other than that, it was actually pretty good. I really liked adding the peas in the risotto. It added a little more texture to a typically creamy dish. And the mint leaves were very fresh and made the dish very summery. In a large saucepan, heat the oil. Add the garlic and shallot, cover and cook over moderately low heat until softened, about 3 minutes. Add the rice and stir over moderately low heat until slightly translucent, about 2 minutes. Add 1 cup of the warmed chicken stock and cook, stirring, until nearly absorbed. Continue adding the stock, about 1 cup at a time, stirring until the stock is absorbed before adding more. Cook, stirring, until the rice is al dente and suspended in thick, creamy liquid, about 17 minutes total. Season with salt and pepper; discard the garlic (we used minced garlic so we just kept it in). Add the peas and cook just until heated through. 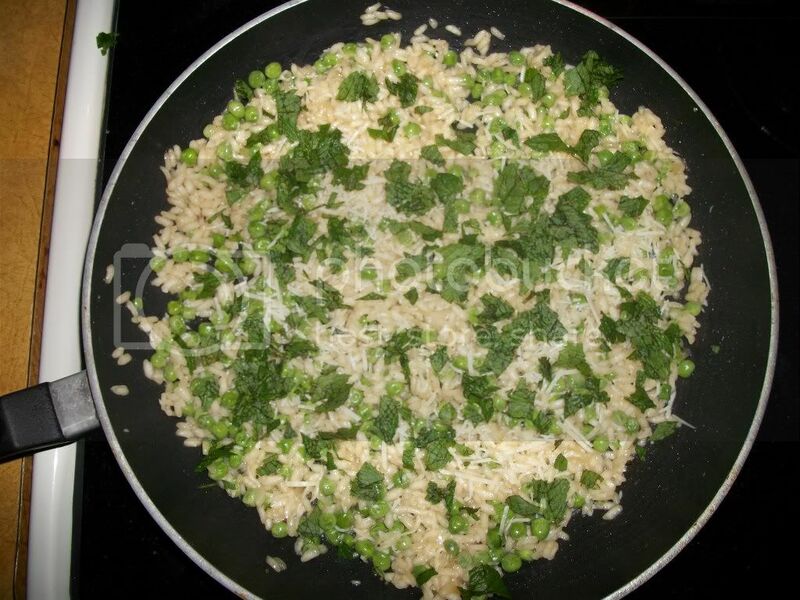 Stir in the cheese and mint and serve. Please note: If you halve the recipe, I would only add about 1/2 cup of broth every couple of minutes, or you are going to run out of broth before the risotto is fully cooked. I also keep my heat a little below medium so that the broth doesn't evaporate quickly (which can happen if your heat is too hot). For the pot holding your broth, once it starts to simmer, reduce the head for that pot to low or med-low. If you get to about 10 minutes and you have about half of your broth left, you are doing good. That is typically how I check my heat.